Stanley Gibbons are offering the “Aureum” collection of the Queen Victoria “Jubilee” issue, one of the most comprehensive ever formed on this issue with over 500 items for sale and a total retail price of over £1.5m. You can view the PDF catalogue or visit their website to see which items are still available. The collection features many unique and key items such as essays and proofs, as well as the more mundane but collectable controls and marginal multiples. After seeing the advertisements for this collection at the Stanley Gibbons stand at Stampex back in September 2015, I was lucky enough to be allowed to view the collection at their offices on the Strand before work began on breaking it down. I must admit that I was expecting to see more handpainted essays after the recent sales of the Lady Buiri and Chartwell collections, but I couldn’t fault the number of die proofs, striking book pieces and colour trials, a few of which did indeed come from these prestigious sales, but with many more that I hadn’t seen since the days of the Robson Lowe catalogues in the 1970s to 1980s. Two of the more striking items were lots 398 and 399, two essays for the proposed embossed 6d value, priced at £6’500 each. The digital images don’t do these items justice! 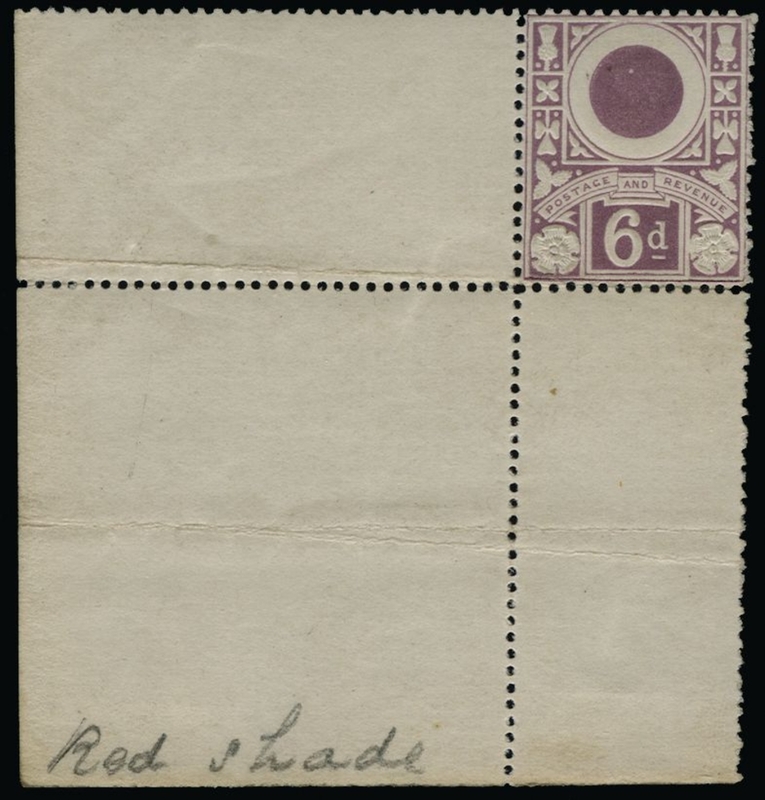 The item featured at the top of this post is another favourite of mine, with a colour trial of the 1890 10d in the same colour as the 1887 9d alongside, with the same two stamps also struck with a experimental cancellation. This piece will set you back a cool £17’000. I’m still learning to appreciate the scarcity of the different marginal settings of the Jubilee issue, and this collection is an important reference in this respect. In fact three of the scarcest were featured on the front cover of the catalogue; the 2d with continuous “Jubilee” lines, the 4d with thin horizontal lines and side and no block lines underneath; and the 10d with the a vertical dull purple block line down the left hand side. A collection of these marginal settings are of course more complicated by the 1/2d values with the range of control letters and the different ways of perforating the 240-set sheets. I was told (unfortunately too late) that the item above was a potential sleeper; a much undervalued item. 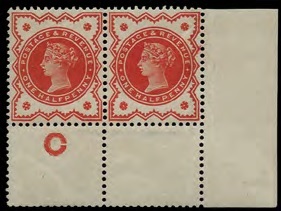 Although nothing special to look at, lot 40 was a 1/2d vermilion “C” control pair, but it was perforated by an experimental perforating machine which left no extension hole at the right hand side. Stated as being the first example of this that they had handled in over a decade, it was quickly sold for £650.